Videos, solutions, worksheets, games, and activities to help Grade 3 students learn statistics. Gathering data requires an organized system of collecting the information. Using tally marks is a simple way for you to keep track of information as you collect it. Tally marks are most effective when recorded in an organized column chart like the one below. Grouping the tally marks in 5s makes it easier for you to total the numbers in each category by skip counting. Remember to keep your bundles of 5 separate from each other. Tally charts should always be given a title to inform the reader about the meaning of the data. How to use a tally chart to record data from a simple survey? How to make and interpret tally charts and frequency tables? a) Make a tally chart and frequency table to show the data. b) How many students had 5 words correct? Another useful tool for organizing data is the line plot. The line plot displays each piece of data by marking an ‘X’ (cross) above the corresponding choice/value along a horizontal line, as shown in the following examples. What is the most common type of pet owned by students in Grade 3 ? 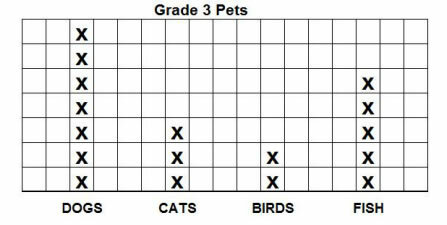 What is the least common type of pet owned by students in Grade 3 ? How many more dogs are there than birds? How many students in all own pets? There are 5 more dogs. There are 17 students with pets. The table shows the number of calories contained in one serving of students' favorite cereals. b) What is the range of the data? A bar graph is another useful tool for organizing data. Bar graphs can be vertical or horizontal. The height or length of the bars represents a number and each bar represents a separate category. Which color did the most children like? Which color did the least children like? How many more children liked red than yellow? How many children liked red, green and brown?